It was a wonderful weekend. I didn’t work this Saturday and spent the time with kids, I squeezed into prepare Jhangiri, in view of one entry for many events. I feel bad for not having enough time to prepare one exclusively for each event as Asha does. But then she is a superwoman! I always think that all the bloggers first consult with her and then announce the theme, because she has dishes for every event! All exclusive with wonderful steps and pictures! I think there is some conspiracy. Since she is such a wonderful person, all want to make sure she has a dish and then announce!.. :D..On my part, since she is such a versatile cook and has been using mw for years, have no qualms because she will have atleast one dish for my event! So after spending time at home, I went to meet Lathamma. She is such a cute and active lady, I felt I have always known her for ages. And I feel I need to take special care to be like her when I reach her age. She is just wonderful with her tales and just talking on anything. Time just flew, what with me eating her Naan with Tofu Koftas. It was yummy except the tofu had more like a non-veg taste. This was the first time I had. Then I had her mixture, I made sure I picked out those lovely Aloo chips. Well if I explain anymore I might inquire wrath from all! Best of all (read highlight), I met her brother, sil and their 7 yrs old boy Rahul. He jabs non-stop. It would take greater effort than ours to make him stop for a while. Once they left, we spent chatting on things non-stop. It was with great reluctance I made a move. Sunday was also great since I planned to prepare something new. For many days I had been planning to try her Cinnamon’s recipes. I looked up all her chicken recipes. Everything was mouth watering to look at. Only I had one hindrance in way, I wasn’t having cream. Finally decided to try Chicken Tikka Masala. I wanted to prepare Naan for this. So planned to rest the Naan for atleast 4 hrs. But was held up with Breakfast preparation and got around to this only by 11 am, so had to manage with whatever time was there to spare. Naan is always my favorite bread that I order every time we eat out. Amma never attempted to make this at home because it involved tandoori. 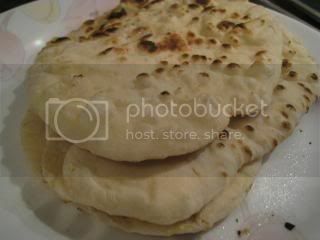 But the number of naan recipes that were blogged in recent times, made me crave to make it at home. I had prepared it two other times, which came out very well. But the downside of it was, it got completed so fast that I didn’t have time to take a shot. First time round I used yeast but it never rose. Second time I used baking powder and both the times it came out really good. This time, I wanted take advantage of the dry yeast packet that was lying in the freezer and try out Naans. As the time was running, didn’t really pay attention to the fact that milk was tepid and to add to it the climate was chill!. Result was, the yeast didn’t rise to the occasion, again!. So in the end I resorted to adding 1/2 tsp of baking powder and let it rest for 10 mins before rolling them out. Please don’t ask me which actually resulted in the perfect Naan, was it the yeast or the baking powder? I have no clue myself. Result was superb. Soft and tasty Naans were ready. But one note, this can be enjoyed more if you had somebody else cooking it for you! Take the yeast in a glass and add sugar and milk. Let it rest for 10 mins. It should rise, if it doesn’t no problem. Add baking powder. Take a bowl, add the flour along with salt and the yeast mix. Knead well to get a pliable dough. Cover with wet muslin cloth and keep it in warm place for it to rise. Once you are ready to roll out, divide to equal balls. It yielded about 10 small sized Naans. Roll out as a triangle by dusting it with the flour. Heat a tawa. Take the rolled out naan, smear water to one side and stick it on the tawa. On the top, wet with water and press sesame seeds. Put the flame to high and turn the tawa facing the flame. Ensure all the sides gets cooked. It will start bulging out. Then turn again and remove the naan, You can cook the Naan again on the direct flame. When you remove to a plate, smear butter on the top. Serve it with Chicken Tikka Masala. I adapted Chicken Tikka Masala from Cinnamon, it came out really great. I changed measurements and ingredients as per our taste. Moreover I searched for recipes which didn’t require Cream as I didn’t have on hand. Thought this didn’t require, but the naughty girl that she is, mentioned it in the end. By then I had ordered boneless chicken to be delivered. So thought would ignore it. I guess it didn’t matter much as I had toned down the spice in all the stages. And she asked for mace, I replaced nutmeg instead. Marinate the chicken pieces, with the ingredients under chicken tikka for 2 hrs. After 2 hrs, heat a pan and add the marinade with chicken pieces and cook it on high. Keep stirring to ensure it doesn’t get burnt.You can cook till the chicken is cooked and the masala gets coated to the pieces. Heat oil in a pan and add cloves, cardamom, cinnamon, cumin. Once they splutter, add cashews and onions. Fry till its little brown. Take all the ingredients in vessel and boil till the tomatoes are soft and you a sauce like texture. Cool and Blend to a smooth consistency. Heat oil over medium heat in a large pan, and add garlic, sauté till golden brown. Then Add onion paste and fry for few mins, then add tomato sauce and chicken tikka pieces. Cook covered until chicken is done, then add garam masala, fenugreek leaves, and adjust salt. Finally garnish with coriander and serve. You can fry all the ingredients for Onion paste in a pan, remove and fry the chicken tikka in the same pan. Take a second pan to do the final tadka and add the onion and tomato pastes. Once it starts boiling, you can add this mixture to the chicken tikka. Add water and let it boil. This way we save time and cleaning too! My daughter loved it so much, though hubby would’ve liked it to be more spiced up! I was little upset about it. But he cheered me saying I need to be happy that my daughter was happy about it. Its not easy getting her to eat. Though I had reduced the measurement a lot, we had this going strong for today also..:D. So think through the measurement again and proceed! Ok for want of better name, I christen it myself. The base method is same as my Chicken Fry, but added Cinnamon & Nutmeg powders and dry roasted it. Then add chicken pieces. Fry well so that the pieces gets coated. Simmer for 20 mins. Then add Cinnamon and Nutmeg powder and cover again to cook till the chicken is well done. Had a quick assemble of all the three for the photo session, before the Naan got devoured! Prawn Roast and some new goals! Ashaji is seriously a super woman Sri.. well said about her and Lathamma! Glad u ppl had a great time. Wish I cud be there with u chatting and munching.. heehhe..:) and I am vegetarian, so this post is not for me..:)) Naan looks delish though. Excellent spread, but very elaborate, how do u get the time for such lengthy cooking time?? Non-veg dishes look fabulous. I am getting ready too for Thanksgiving, cooking Turkey cutlets and a whole chicken in clay pot! I will try your Naan too, I am forever looking for naan recipes! Yeah thats a great feeling you get when you meet a person for the first time and feel that you have always known them. i could not help but agree with what u said about the naan..if someone else makes it for u..it is better…sometimes when i make elaborate food..which is rare…i get so tired, i feel like eating curd-rice for the day!! Oh I thought something went wrong when I commented an hour back! You had to prepare naans for anjana as you left her and came to meet me and eat naans! 😀 Did your kids enjoy the mixture? All three items look amazing. I also want to try naan at home but am scared. May be one day………..
Love chicken tikka and naan. Thanx for sharing. Love all the dishes. When i try to make naan it ends up a disaster. the naan looks lovely. if you don’t have cream, just add milk powder. Lovely Naans & Chicken curry.. Really yummy! Your naans look perfect.. weather it was yeast or baking powder.. all that matters ultimately is taste, right?? Awesome! This is such a mouthwatering spread!!! u always have a great thalli for food and make me to prepare everything and put on weight. Nowdays myself and my husband putting on weight eating so much, we want to avoid but cant help. One more thing, today i wanted to prepare naan and u posted the recipe what a coincidence. I will visit your website as soon as i get up from the bed and decide what to prepare. Happy cook, sure you are most welcome..you can try this..its pretty easy..
Siri, yeah would’ve loved to meet you too..hhaha..I understand..
vimmi, thanks…why don’t you try this one out..it was quite easy! Dhivya, thanks..will do it sometime soon..
About the baking powder..you need to add to the flour while kneading it to a dough….if you have any other doubts..you can always mail me..
wish you had given your name! yummy stuff 🙂 I want to make naans too. Hey Sri! Tried out the chicken fry! Really yummy! Thanks for the recipe! Thanks for the feedback Ashu, I am glad you liked it! I just made you naan recipe! Totally loved it! Jackie Thanks for dropping by. Glad to know you guys enjoy Indian food. If you are familiar making pizza, Naans are quite simple too..:)..do try and share your experience..